By Xah Lee. Date: 2011-06-08 . Last updated: 2018-04-24 . This is the cheapest keyboard that Microsoft offers. Microsoft Wired Keyboard 200. This came out around 2010-07. Stopped around 2016. If i were to use a non-split keyboard, i'll like this. Plain and functional. Note the standard F keys, arranged in traditional 3 clusters, 4 keys each. This means you can press them without looking. Also, the keys are full-sized. Nice. Some fancier keyboard make these into one continuous row, and as flattened non-tactile buttons. This is second cheapest from Microsoft according to MSRP (manufacture's suggested retail price). Added are 4 multimedia keys and a calculator launch key. But as you can see, there's one screw-up already. The function keys F1 to F12 now became special buttons, losing the tactile quality of keys. This is new. Seems just came out in 2011. As we advanced into the higher-end models, the form gets stylish, function goes downhill. Notice the F1 to F2 key are degraded further, now becoming one beatific continuous row. You need to look at them to hit the correct key. Also new is that they replaced the right Windows key with a Fn key. For advanced keyboard users, this means, you are losing a modifier key. 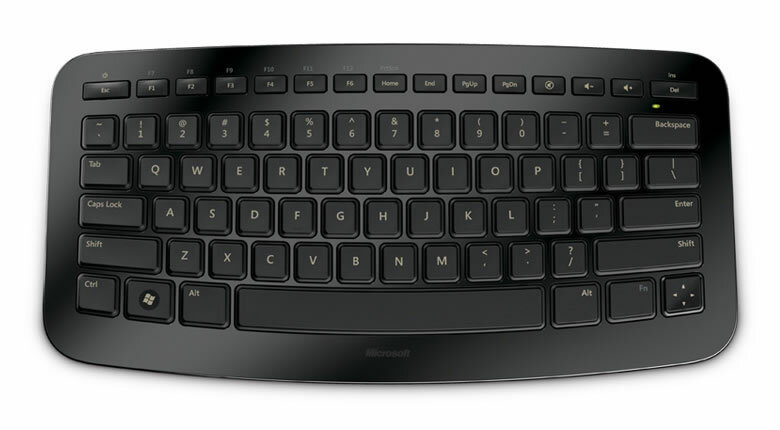 Microsoft Wireless Comfort Desktop 5000 5180×2574 Worst example of function keys. ① Continuous row, no group-gap. ② hard-to-press cheap buttons. Notice the top buttons — one beatific continuous row. You can't feel them, but you must look! There is a desktop set with this keyboard, named “Microsoft Wireless Desktop 6000”. But actually, there are 3 generations of this keyboard+mouse set, all physically different but sharing the same name, with “v1”, “v2”, “v3” on Amazon. The v1 is dramatically different than the other two. Dunno why Microsoft named them the same. They all got very bad reviews. Usually like connection problems. This comes in 2 versions, with or without number-pad. It seems that this keyboard is also called “cat keyboard hero”, because the images on Microsoft site is named that. This is new in 2011. Apparently, this one is designed for couch potatoes. Note the newfangled 4-in-1 arrow button. Now comes this smooth bull. Not a Microsoft keyboard, but i had to put it here. This ErgoMotion keyboard with its patented pivot-motion design that automatically adjusts to your natural hand and wrist position is the world's first intelligent keyboard that prevents Repetitive Stress Injury. The patented DPC - Dynamic Positioning Controller automatically moves based on your use pattern capitalizing on productivity while diminishing operator hand and wrist fatigue and discomfort. Supposedly, this keyboard moves slowly, by a built-in motor, so that your hand muscle use is not always the same from the same position, thus preventing you from getting a Repetitive Strain Injury. But, from its clean geometric look, like Apple's keyboard, i can tell you right away it's PAIN. All Garbage. They Are ALL Garbage! Function keys in one beatific continuous row. This makes them useless without looking. Multimedia keys and app launcher and other buttons merged into the F keys. This means, you have to press 2 keys, usually requiring both hands, with the Fn. The keyboard is non-split. PAIN follows your typing eloquence or verbosity. Flat shallow keys. Shallowness is not my style. I prefer depth and solidity. I don't want a damn Fn on the bottom right. I want the ▤ Menu key and or ❖ Window key. Because, i can remap them to Super or Hyper for Emacs for many purposes. [see Emacs: How to Set Super and Hyper Keys] Fn key is usually hardwired and hardware-specific. That means a dead-horse squatting in the front seat. For keyboards that i deem useful for programers or heavy typers, see: Best Ergonomic Keyboards 2019. See: KeySweeper, Sniff Passwords from Wireless Keyboard. • Compare their sizes, the keys on them.